​I have a BSc in Biological Sciences, specializing in Marine Science and a PhD in Marine Science from the University of Auckland, New Zealand. During my PhD studies and after graduating I worked in industry as an acoustician in New Zealand before working as a Postdoctoral Fellow at the Chinese Academy of Science's Institute of Hydrobiology in China. 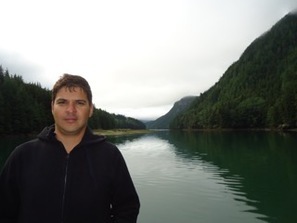 I am now a Mitacs Postdoctoral Fellow at the Juanes Lab, working closely with Jasco Applied Sciences Ltd. My research is on the distribution of fish species in the western Canadian Arctic, with a particular focus on a keystone species, the Arctic cod (Boreogadus saida) using passive acoustic monitoring. Using statistical and acoustic modelling we hope to predict the potential impacts of anthropogenic noise and environmental changes on fish distributions. This work will be the first to investigate the ecoacoustics of Canadian Arctic fish and will provide essential data relevant to indigenous food security and long-term acoustic datasets needed to inform effective management. I am also currently working on projects in Hong Kong, New Zealand, Australia and the United Kingdom. Amalis is a Biologist from Spain who came to Canada in 2009 to do an MSc. in killer whale acoustics. Since then she's been doing research for DFO analysing acoustic recordings looking for marine mammals and participating in BC cetacean surveys in the summer. Her current research in the Juanes lab focuses on fish acoustics. She is investigating the presence and seasonality of fish sounds at the Bowie Seamount Marine Protected Area and will correlate these results with those from a MEOPAR-funded project that is measuring and monitoring the levels of anthropogenic noise at the same location. The ultimate goal is to investigate the effects of anthropogenic sounds on fishes at the Bowie Seamount MPA. Will is interested in fine scale spatial and temporal patterns of habitat use by Pacific Salmon in their first year at sea. These patterns determine how juvenile salmon experience bottom up and top down regulators of first year survival; which in turn may be the primary drivers of variable recruitment in a changing ocean. Will's current focus is understanding how juvenile Chinook Salmon distribution, diet and growth are influenced by the gradients of tidal mixing and water column stratification that are conspicuous characteristics of the inside waters of the Salish Sea. ​Kieran’s graduate research is a collaborative effort between the Juanes Lab, the Ecological Interactions Research Program and the Hakai Institute, and seeks to investigate the potential effects of both traditional and contemporary shellfish aquaculture on marine biodiversity. 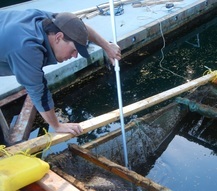 Kieran and the Ecological Interactions Research Program have surveyed 24 First Nations clam gardens, shellfish farms, and unmodified habitats within multiple regions (Quadra Island, Baynes Sound, and Calvert Island) for the last two years. Kieran is now in the process of determining how marine species respond to these habitat modifications. Visit his website here. 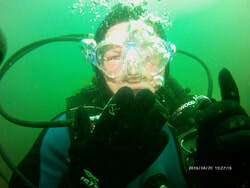 I am interested in studying underwater sounds from marine fauna and anthropogenic activities. I have been involved in the development of monitoring tools to automatically detect, identify and localize marine mammals using passive acoustics. My project, part of CHONe 2, focuses on studying sounds produced by fish in British Columbia. I will use simultaneous acoustic and video recordings to associate fish sounds to specific species and behaviors. Fish will be localised acoustically in three dimensions using a compact array of hydrophones to determine movement, calling rates, and source levels for individual fish. The influence of noise on fish communication will also be investigated. My interests lie in quantifying predator-prey dynamics in a realistic habitat context to reduce uncertainty. In British Columbia, increasing numbers of humpback whales are found in coastal areas associated with high biological productivity of importance to fisheries. I’m therefore investigating complex prey parameters relative to 3-dimensional humpback whale behavior underwater, using a multi-sensor tag attached via suction cups and concurrent measures of prey from scientific echo-sounders. 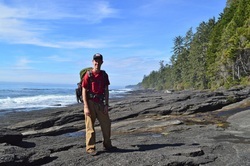 My research focuses on the community dynamics of mudflats and sandy shores on the coast of Northern British Columbia. I will be comparing community composition of infaunal invertebrates and abiotic parameters such as sediment properties of beaches in Prince Rupert, Kitimat and Arthur Island. I will also be working to understand the relative importance of biological and abiotic factors in structuring these communities, as well as how disturbance alters the infaunal communities. Jacob’s research interests include food web ecology and nutrient/energy transfer as they apply to the early marine growth of juvenile Chinook salmon. Specifically, he focusses on determining the role of prey quality in the growth of juvenile salmon. His Masters research examines how the energy content of different prey varies across time and related species. 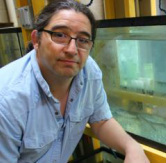 His research will contribute to the growing body of knowledge regarding how bottom-up drivers affect the growth and ultimate survival of Chinook salmon in the Salish Sea. 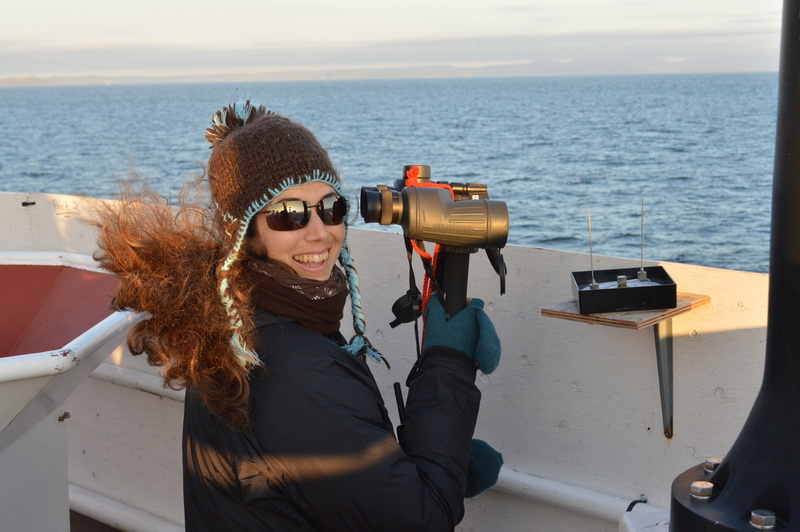 Kat’s primary focus is investigating the impact of anthropogenic noise on marine animals, especially long-term exposure to boat noise from shipping, fishing, and other activities. Her previous research has focussed on characterizing the vocalizations produced by marine mammals, including harbour seals and baleen whales. Her PhD work, part of the CHONe 2 project, is co-supervised by Dr. Juanes and Dr. Corey Morris (DFO-Northwest Atlantic Fisheries Centre). 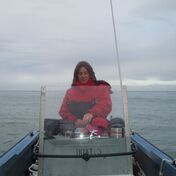 Her research will focus on measuring the amount of anthropogenic noise experienced by commercially-important fish species in BC and Newfoundand, as well as designing experiments to actually test the effects of such noise levels on the behavioural biology of the fish. Kat is also interested in investigating the effect of boat noise on the foraging efficiency of threatened populations of killer whales in BC. She hopes that her findings will help to better manage and protect at-risk marine species, and to support sustainable use and exploration of ocean-based resources in Canada. Pacific salmon and Southern Resident killer whales are important species in southern British Columbia, and their decline has increased public awareness and research. My project is aimed to evaluate the impacts of shipping noise on Chinook salmon behaviour and physiology, preferred prey of southern resident killer whales. Chinook salmon will also be exposed to southern resident killer whale vocalizations to determine their sensitivity and characterize any predator avoidance. I am also recording a variety of Pacific salmon in a semi-natural environment to evaluate the presence of vocalizations. I grew up in St. John's, NL, surrounded by the North Atlantic Ocean—my curiosity about the marine world was driven by its frigid, mysterious waters. For my B.Sc. thesis, I studied variation in antipredator responses of orange-footed sea cucumbers (Cucumaria frondosa) living along a hydrodynamic gradient. My M.Sc. research examines habitat-selection strategies employed by care-giving plainfin midshipman fish (Porichthys notatus) along an intertidal elevation gradient. This work will help uncover how parents balance trade-offs between their own needs, and those of their offspring. Additionally, rising sea levels are threatening to erode sandy beaches faster than they can naturally migrate inland, so my research will highlight challenges that may arise as this habitat is lost. Rob is an MSc student co-advised by Francis Juanes and Sarah Dudas. Along with fellow MSc student Brenna, he investigates the effects of shellfish aquaculture on fish communities in the Baynes Sound region of Vancouver Island. Baynes Sound is one of the most intensely farmed regions of British Columbia, and the industry is growing. However, little is known about how shellfish farming may be affecting fish populations, diversity, or recruitment. Brenna's research focuses on ecological interactions between shellfish aquaculture and juvenile Pacific salmon in Baynes Sound, BC. Shellfish aquaculture has become a prominent feature in this area and requires modification to intertidal habitats. Because these areas are also rearing grounds for juvenile Pacific salmon, it is important to understand how this change in habitat complexity may influence these species at a critical time in their lifecycles. More specifically, Brenna will be investigating relative salmon abundance, diet composition and potential microplastic ingestion across aquaculture and comparative non-aquaculture sites. Laura is interested in the role of seagrasses in the early marine survival of juvenile salmon. She aims to quantify the effects of damage and change on seagrass ecosystem capacities by comparing prey abundance across a gradient of seagrass health. Laura will also use isotope analysis and prey gut contents to determine the relationship between juvenile salmon and prey found in seagrasses, and hopes to provide critical information pertaining to questions about early marine salmon ecology. In much of Alberta, oil and gas exploration has over time left a dense configuration of industrial linear features across the landscape. Such landscape change has the potential to alter wildlife behaviour, movement and relationships, and thus has implications for conservation and wildlife management. Mary, who is co-supervised by Francis Juanes and Cole Burton, is interested in using camera traps to explore the responses of wildlife to seismic line restoration treatments in northeastern Alberta. She plans to use camera traps and GIS analysis to explore wildlife responses such as the effect of treatments on predator-prey relationships, species relative abundance between treatments and the role of human activity in wildlife response. Accumulations of beach-cast sea grasses, seaweeds and other matter, collectively known as wrack, play an important role within the marine-terrestrial ecotone. Jess’ current research is focused on understanding the contribution of an introduced species of red algae, Mazzaella japonica, to the spatial subsidy provided by wrack in Deep Bay, BC. Commercially harvested from beaches within this region for its carrageenan content, her research will also examine how the removal of M. japonica influences wrack characteristics and macrofauna community structure. Jess hopes this research will contribute to our understanding of how introduced macroalgae affect recipient beach communities, while also informing decision-making processes pertaining to the commercial harvesting of beach-cast seaweeds. 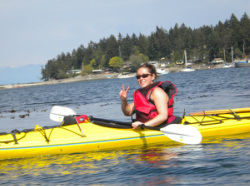 Angeleen is a MSc student and Hakai Scholar with a background in nearshore marine ecology and conservation. Her interests include food web ecology, predator-prey dynamics, nutrient cycling, and marine spatial planning. 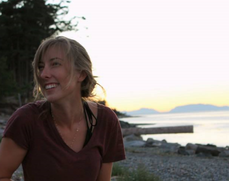 In collaboration with the Hakai Institute, her thesis will examine habitat heterogeneity and connectivity effects of seagrass and kelp forests ecosystems on nearshore fish communities. As marine macrophyte assemblages in BC are undergoing a host of changes, from climate change to expanding sea otter ranges, Angeleen aims to understand how nearshore fish are affected by habitat changes using underwater visual surveys, experimental manipulation, and stable isotope techniques. Visit her website here. ​I recently conducted my master thesis at Francis Juanes lab, working with one of his Postdocs William Halliday. As my master program is originally an European Erasmus Master for Marine Biodiversity and Conservation (EMBC+) I got really lucky throughout the last two years travelling the world. I spent the first two semester at the University of Algarve in Portugal focusing on aquatic ecosystems and their dynamics, scientific diving as well as fisheries management. For the third semester I further moved to Ireland and participated in courses in underwater acoustic, GIS and ecology of marine top predators at the Institute of Technology in Galway. The last stop within my masters was at the University of Victoria, Canada which is a partner university of my study program. Working on ambient noise impact by bearded seals (Erignathus barbatus) in the Arctic within the last half year, I gained lots of well founded knowledge in using acoustic software as well as how to work with acoustic equipment and extracted data. Summed up, this Masters program was the perfect choice for me as I was not only able to stay abroad in different countries but also got to know a variety of research groups and their work. I absolutely appreciated the chance to stay and work in Francis Juanes' team and it was an amazing time. Mangrove ecosystems are being lost at high rates across the world despite their importance as habitats for a number of marine and terrestrial organisms and the ecosystem services they provide. Historically, mangroves have been thought to support artisanal fisheries however most of the mechanisms underlying this relationship are unclear. In a lagoon system in Colombia, SA, I am studying the mangrove and fishery relationship from different perspectives such as the ecological relationships of mangroves and fish, and Traditional and Local Knowledge to determine to what extent mangroves support fisheries and are important for fishermen.